The Nintendo 3DS – Will It Rescue the Video Game Space? Hand-held game consoles have been in the doldrums for a good while but the advent of the Nintendo 3DS is widely expected to change all this. But will it? The 3DS was released in Japan on February 26. The first shipment of 400,000 units was sold out within two days. In spite the massive earthquake that hit Japan on March 11th and the ensuing Tsunami, sales continued to soar. By March 13, another 280,000 units had been sold. Nintendo expects another 800,000 units to sell between March 14 and March 31. The expected yearly total for 2011 is in the neighborhood of 5 million units for Japan alone. In comparison, all DS consoles combined last year sold in Japan around 2.8 million units and a mere 300,000 units in the first ten weeks of 2011. The next release is expected to take place in the UK on March 25th. No shipment delays are expected this month or further down the pike because of quake-related manufacturing issues. If this is indeed the case, sales are expected to clock in just shy of one million units by end of April. 185,000 units were on pre-order by March 22 already and Amazon UK reports that the 3DS is its most pre-ordered game console ever. Total expectation for European sales this year is in the neighborhood of 5 million units. The U.S. is following a few days later, on March 27, and pre-orders are breaking all records. GameStop, Toys”R”Us and Wal-Mart have announced a midnight release opening. It is expected that sales in the remaining four days of March will clock in at around one million units, and the number for the whole year is estimated at 7 million. If all these estimates pan out, we are looking at a first-year total for the 3DS of approximately 21 million units. In comparison, last year the DS sold pretty much the same number. While it is reasonable to assume that the 3DS will accelerate the decline in DS sales – last year it had already been down a quarter compared to 2009 – it is equally reasonable to assume that the DS will not disappear. I would estimate that about half of the 3DS sales will come at the expense of the DS which means that the two machines will see a combined growth of approximately 50% this year. So, you might think, this is the end of the video game doldrums at least as far as the hand-helds are concerned. Not necessarily! There are a number of reasons to think that the 3DS success could be a temporary phenomenon. One of them is the “early adopter” syndrome. According to Everett M. Rogers, who coined the term in his classic 1962 book “Diffusion of Innovations,” early adopters represent 13.5% of the U.S. population. If you define early adopter in the video game space as somebody who buys the machine within 15 months of release, hand-helds are a classic example. 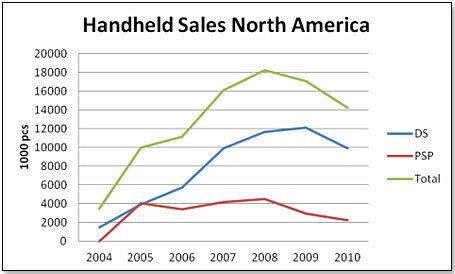 13.5 million of DS and PSPs were bought in 2004 and 2005 and this represents 14.9% of all hand-helds bought up to the end of 2010. 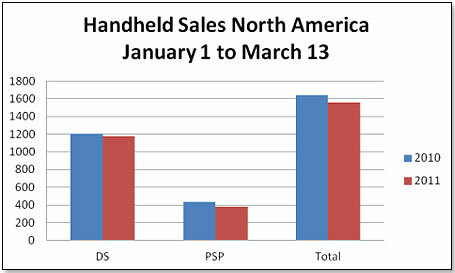 If you look at the individual sales performances, the DS clearly made the transition to main stream consumers and then to the late adopters whereas the PSP did not. The same fate could await the 3DS. The reason for this is its price. The mainstream consumers are much more price sensitive than early adopters and this is demonstrated by the history of the PSP. The console launched at a price of $249.99, 67% more expensive than the DS, and ended up selling 60% less in units cumulatively to 2010. At a price of $249.99, the 3DS could meet with a similar fate. The second reason why the 3DS may not prosper past the early adopters stretch is that, according to research undertaken by Interpret LLC, nearly 80% of prospective 3DS buyers already have a portable gaming device and about 50% have two of them – DS, PSP, smart phones, tablets etc. With a price tag of $250 many of them will think twice before they buy yet another machine to carry around. 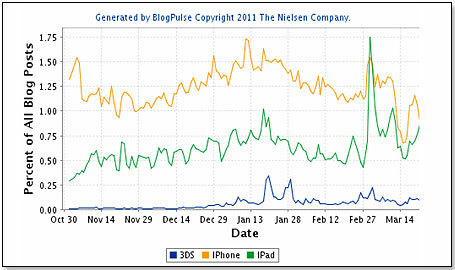 There is already considerable evidence that devices such as the iPhone or the iPad are being widely used as gaming platforms. In fact, about one-third of their use is already devoted to gaming and this is expected to increase. Is it really a coincidence that sales of the DS began to flatten out and then decline when the iPhone was first introduced? Both the iPad and the iPhone are no longer dependent on the early adopters who gave both platforms their first lift, as they have clearly moved into the realm of the mainstream consumer. As a consequence, when the 3DS has exhausted its pool of early adopters and is ready to go to the more conservative 87% of the North American consumers, the company may well find the field totally preempted. These concerns are shared by national buyers at the large retailers. They are not worried that the machine will not do well this year. They are convinced it will. However, they also think that the 3DS could disappoint further down the pike unless Nintendo pretty quickly comes up with a price reduction. To ensure a smooth start for the console, Nintendo is embarking upon a unprecedented pre-launch advertising campaign. In the UK, for example, Nintendo has blanketed the country with TV ads and expects that nine out of 10 Brits will have seen the 3DS TV ads before the product launches. In North America, the company has over the past few weeks embarked upon a similarly aggressive campaign, which is going to be further backed by impressive store displays at the major retailers on launch day. To come back to the question asked at the beginning of this article, will the 3DS return the hand-held gaming console to its former growth path? In the short term, yes. In the long term, probably not.